Helen Pluckrose (@HPluckrose) is one of the many fantastic people I follow on Twitter. She's a secular humanist in London. She also happens to be one of the very few people I follow on Twitter who regularly interacts with people with whom she disagrees without being disagreeable and resorting to name-calling. Yes indeed, she's a rare treasure! Helen also happens to be responsible for the content of the image above. No, this is not just another mindless meme. Helen uses this image in her interactions with others. I've seen her do it, and it is wonderful. 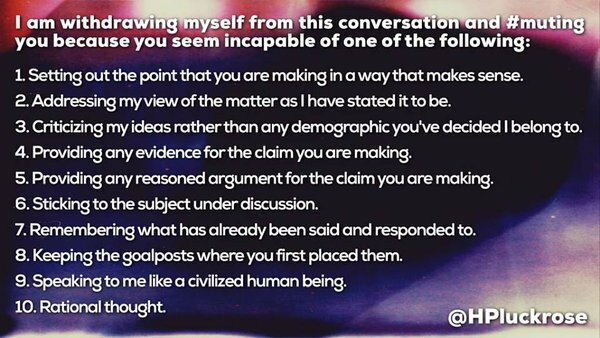 When someone is arguing with her and repeatedly shows that they are unwilling or unable of doing one of the 10 things listed in the image (all of which are in short supply on Twitter), she calmly lets them know by tweeting the image and pointing out where they are failing. And best of all, she then actually withdraws from the interaction. I give her a lot of credit in that she doesn't do any of this hastily. It would be easy just to slap this on someone at the first sign of a problem, but she does not do that. She tries to interact with the other party in good faith for far longer than I'd have the patience to attempt. It is only after several tweets back-and-forth that she brings out the image and ends the interaction. This is my new favorite thing on Twitter.